#1 Ohio State: As competitive as the Buckeyes were this last season, you have to realize that they accomplished all that they did under their third-string quarterback who led them to a strong 14-1 (as well as winning the first ever College Football Playoff National Championship) record. Returning in 2015 with the majority of his team intact and possibly 3 healthy quarterbacks at hand, a repeat championship victory would not be a surprise for coach Urban Meyer. #2 TCU: What? Not Oregon? 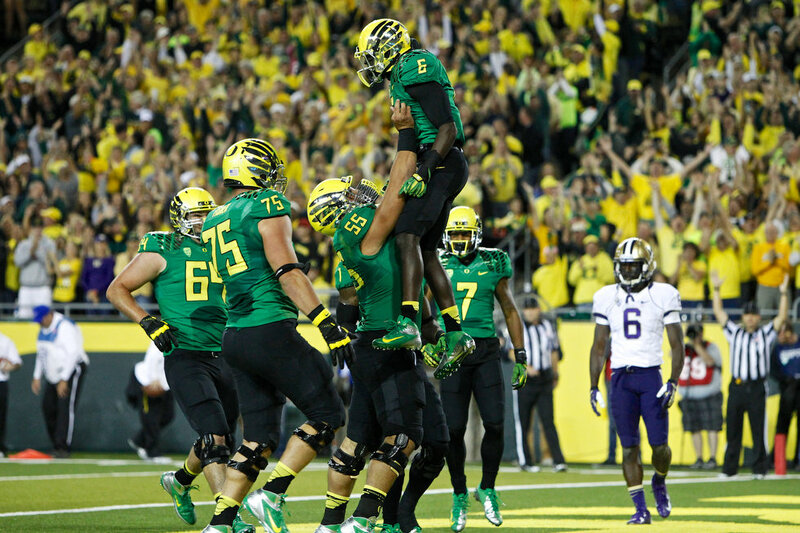 With Mariota gone, the Ducks will find a hard time finding ways to win, thus making them fall out of the No. 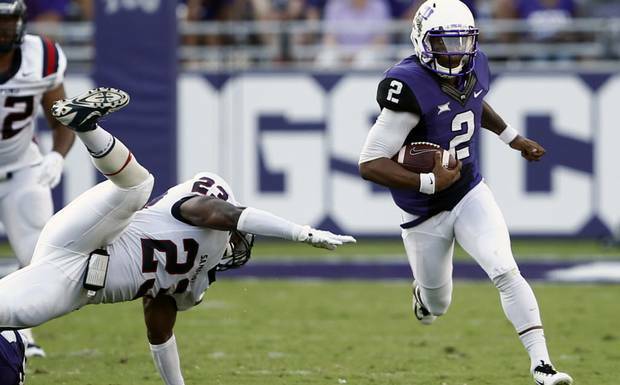 2 spot and making way for the offense-orientated Horned Frogs. TCU and Ohio State both deserved spots in the College Football Playoffs this last season, however only Ohio State received entry, while TCU was left out due to an unfortunate Big 12 controversy and an undefeated (and overrated) Florida State team. If TCU can strengthen their defense, you will most likely see them in the College Playoffs on New Year’s Eve. 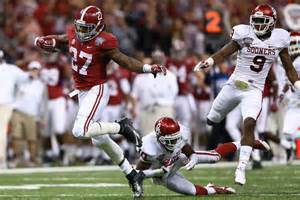 Alabama Running back Derrick Henry. #3 Alabama: Alabama will loose some key players to the NFL Draft this year, however Alabama is still Alabama, and with the reputation of Nick Saben combined with the potential of running back Derrick Henry, you can only assume for there to be another great season for Alabama. #4 USC: This one is a stretch, but my reasoning behind it is that Georgia (being in the SEC) and Michigan State (being in the Big 10) will either finish just outside of the Top 4 or will take the spots of the other two teams from their conference that I believe will be in the Top 4 (Ohio State and Alabama). That being said, two same-conference teams in the Top 4 seems highly unlikely, therefore the 4th spot must go to either a ACC, Big 12 (pending whatever changes they make to the conference for next season), or PAC-12 team. 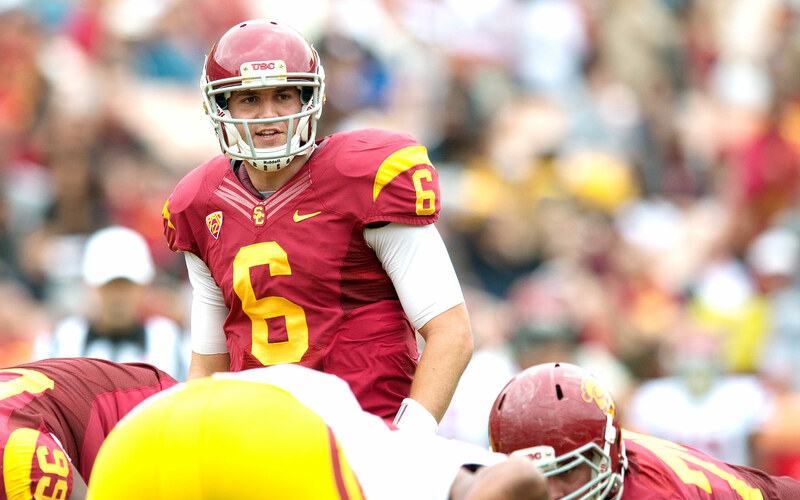 Between those 3, my best bet would be the promising USC team, who showed much improvement as the season came to a close. 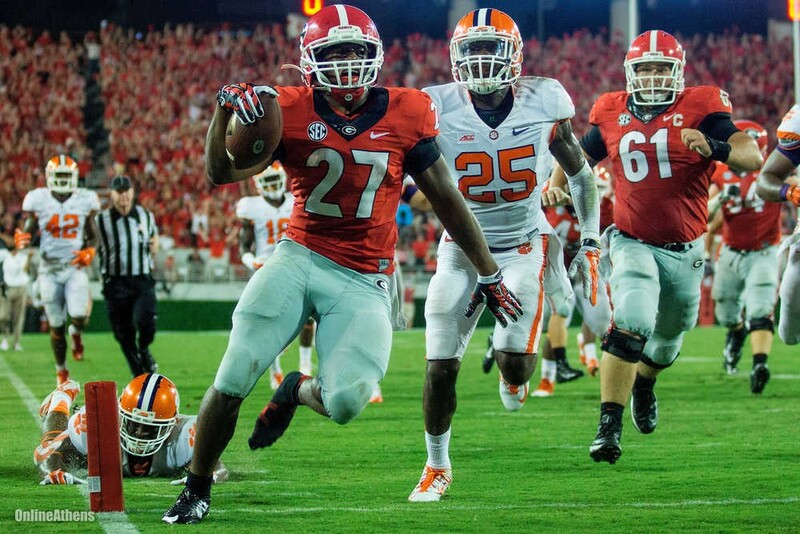 #5 Georgia: Georgia’s running game in 2015 should be one to watch out for, as well as their new star running back Nick Chubb who ran for 1,547 yards and 14 touchdowns in only 8 games this last season. With the way they played this last season, it’s safe to say that they are on a road for success, putting Georgia in definite competition with Alabama for the SEC Championship Title. 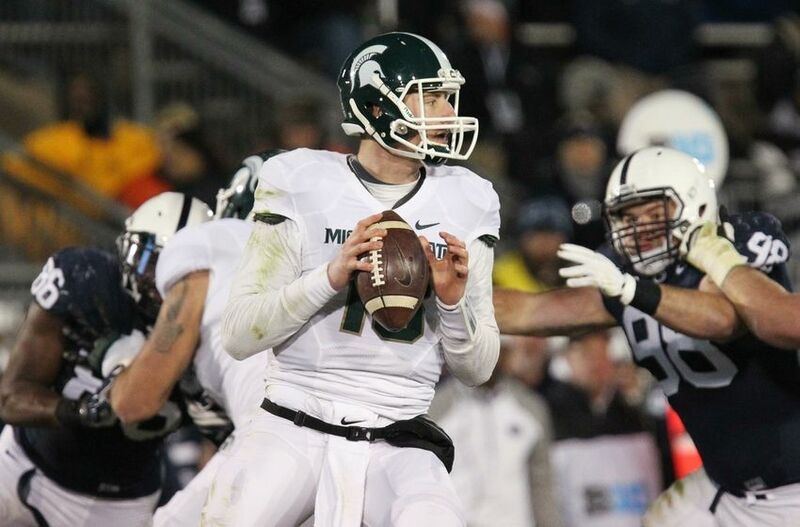 #6 Michigan State: This really depends on what team shows up next year. With the changes on staff and on the field (including their Defensive Coordinator Pat Narduzzi as well as key running backs and receivers) the Spartans will face a challenge in rebuilding. If they are able to remain as good as they were this past season however, expect them to give the Buckeyes a run for their money. 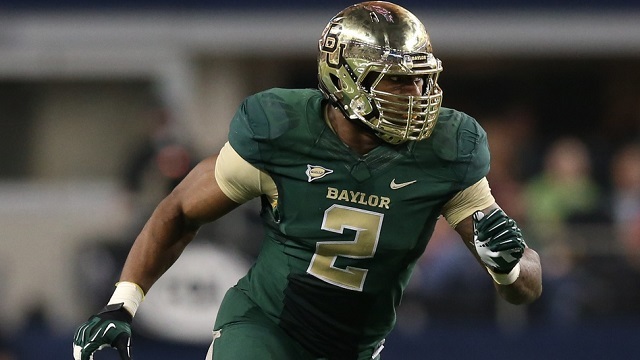 #7 Baylor: Redemption would be the best way to describe the Bear’s mindset going into 2015. After being excluded from the Top 4 over the TCU/Baylor conference controversy, as well as blowing a huge lead against Michigan State to lose in the Cotton Bowl 42-41, Baylor could use a good season to wipe the slate clean. Losing their star quarterback may be an issue though, and with the red-hot Horned Frogs looking to make the College Football Playoffs this next year, redemption may not come too easily. #8 Oregon: Yes Oregon is good and yes they are Oregon, but they just lost Marcus Mariota, and realistically that’s going to be hard to overcome (I mean it’s not like every quarterback you have is going to be Heisman quality, with the exception of Ohio State). But yes, they are Oregon, and the skill that they have is some of the best in the country, and though I wouldn’t count them out just yet, I don’t expect them to be in their prime come next season. 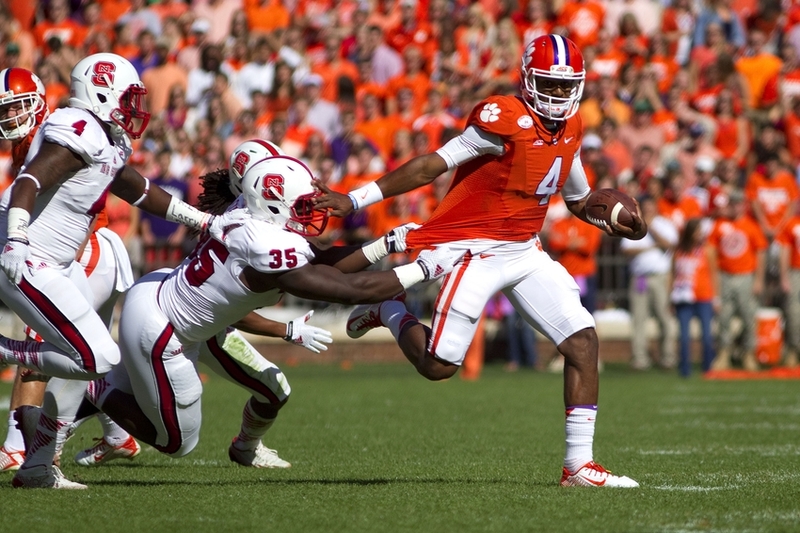 #9 Clemson: Potential is the key word here for the Clemson Tigers. Heisman-candidate and quarterback DeShaun Watson should return next season upon full recovery from a knee injury, which would push the Tigers into a good position to light up the ACC. With a team of skillful young players and a credited defense, Clemson has the opportunity of a few good seasons ahead of them. #10 Auburn: Auburn, Alabama, LSU, Mississippi State, Ole Miss, Missouri, Georgia, Texas A&M, and even Arkansas all showed strong contention for greatness this last season. There can only be one conference winner however, and although my pick is not the Tigers, I do believe that they will again have an above average year. Did I leave your favorite team out? 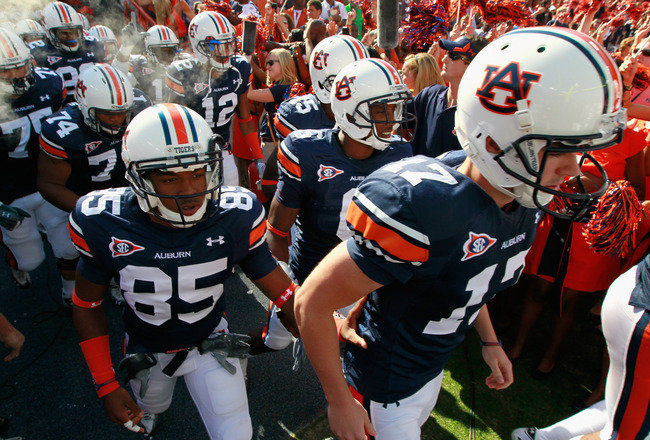 Don’t worry, they may be in my next article, My 2015 College Football Not So Top 10. That article will be published soon and, just as this one did, it will definitely have a few surprises in it. Hello! My name is Jarred Eads. I am currently enrolled at Grand Canyon University here in sunny Phoenix, AZ, and am also a College Football enthusiast.